This walk explores the northern end of the Aup du Seuil - between the Pas de la Mort and the vallon de Pratcel. It's a fairly easy day, with relatively little ascent, and it can be readily combined with an exploration of the Guiers Vif cave, which the time given assumes. The route (map) starts of at the base of Cirque de St. Même; climbs to the Guiers Vif resurgence and cave via the waterfalls; continues up to the synclinal valley above by the Pas de la Mort to the Aup du Seuil, turns north to the vallon de Practel via the Habert de la Dame, which is then descended back to the car. The Cirque de St. Même is located some four kilometres to the south-east of St. Pierre d'Entremont, at the end of the D43E. The Regional Park authorities have provided a large car park a couple of hundred yards before the meadows in front of the cirque, and vehicles can no longer drive into this little piece of paradise. This area is understandably a honey pot attraction for day visitors, and is best avoided at weekends, when the PNRC charge €3.50 (2017) for car parking to help stem the tide. From the car park (860 m, grid ref. UTM 31T 72625 50316), follow the continuation of the tarmac road through the forest. You will soon enter an area of flat meadows and forests, with the river running along a wide shingle bed. There is a chalet hotel here, and a small bar offering refreshments. Ahead are the cliffs of the cirque, with the river resurging from a couple of springs half way up, before immediately plunging over a double waterfall. Just beyond the buvette is an information notice board, where you can get your bearings. You have a choice of two routes. You can either plough somewhat resolutely up the main track on the north bank, or you can follow a path which ascends the south bank, visiting the waterfalls en route. This takes somewhat longer, but is a lot more scenic. The two routes eventually rejoin. Today we'll choose the latter. Return to the start of the meadow, and cross the stream by the footbridge. The path heads to the back of the meadow and enters the trees. After a few minutes it reaches a junction - keep left. The path climbs steadily before reaching another junction signposted the Cascade d'Isolée. A worthwhile ten minute deviation here leads to the first of the three waterfalls. Continuing along the main path for a further ten minutes, you will drop down to a small bridge below a second fine waterfall - la Grande Cascade. The path then crosses to the north bank and ascends steeply to meet the main route. Turning left, after a couple of minutes a further junction on the right drops down to the la Cascade de la Source, which is particularly impressive in wet weather. As its name implies, it is situated directly below the springs of the Guiers Vif resurgence. The Guiers Vif resurgence is the largest in Chartreuse, and the cave entrance above it is, without doubt, the most spectacular in the massif. The entrance area is made up of three sections. First, there is the resurgence platform where up to four springs emerge, from which there are fine views down the valley. Above that a large natural tunnel leads to the Vestibule, which is a 70 metres open section between the tunnel and the cave, and may be part of the original cave which has since collapsed. From the scree slope by the waterfall, you can make your way up to the resurgence platform by climbing up in the corner of the rock wall with the help of some iron work (Difficulty 2), and following a rising traverse. This is a fine place to enjoy breakfast. When water levels are reasonable, you can make your way through the impressive tunnel with the help of some chains, into The Vestibule. Once through the tunnel, make your way up the wide ledge on the right onto an arrête. Sometimes, however, there are deep pools barring progress through the tunnel, when it is necessary to retreat back to the main path, and follow that round to the right along the pas Ruat to the same place. From the vantage point of the arrête above the tunnel, you get a fine view of the entrance to the cave. You can make your way easily down into The Vestibule, and towards the 30 metre wide, 10 metre high entrance. This cave is impressive, and provided that you have adequate lighting, and there is no flowing water apparent, well worth a 30 minute visit. As in all caves, you do need to take care. Here, the entrance ledges are a little slippery, and there are some pools of water that need traversing around. The passages are also large, so you need to keep your bearings. However, you will find a map attached, which has been adapted from one made by Lancaster University Speleological Society in 1969. Once in the railway tunnel-type entrance passage, you will see that the passage divides into two, with an impressive 6 metre high pillar in the passage straight on. Keep to the ledge on the right to avoid the pool, and traverse round into the passage on the left. After fifty metres of easy going, the passage turns sharp right, with a smaller continuation straight on. It's worth having a look straight on - there is a small crawl with a veritable gale blowing out. This eventually leads into a river passage and an alternative entrance from the plateau high above. 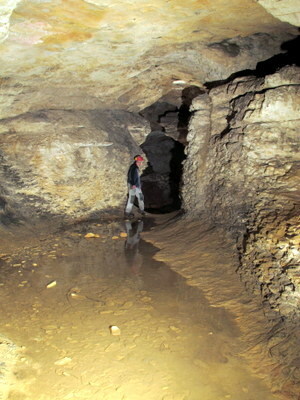 The main passage continues for a hundred metres to a junction in a large chamber. If you peer to the right, you will see daylight along the other passage from the entrance. Make a note. You can then follow a series of very large chambers for a further 100 metres before the passage starts to drop down a boulder slope into the main sump, after which the passage continues underwater. Make your way back carefully to the junction of the two entrance passages, and take the left one this time. The entrance Pillar is within 30 metres. There are other passages, totalling well over a kilometre in length, but these are not for casual exploration and should be avoided. Having visited the cave, we now need to make our way up to the synclinal valley at the top of the cirque. Make your way back up out of The Vestibule, and follow a path up the rocky arrête over the tunnel. This is the Pas Ruat, and it leads us back to the main path. Keep straight on at the junction. For the next half an hour, the path meanders its way up the cliff, from ledge to ledge. Some of this is a little exposed, but quite easy. Minor scrambles are assisted with iron work, and railings have been fixed along the more unnerving places. Eventually, you come to the Pas de la Mort itself - an ascent up a chimney assisted with chains, ladders, and iron rungs fastened into the rock. This follows the tree-lined rake which may be seen in the top left of the photograph. The whole section of path from the cave to the Pas de la Mort is good fun, and should be lingered over. Once up the chimney (1280 m), the path continues to rise through the forest well above the valley, where you may spot a nineteenth century boundary stone which once marked the frontier between France and the Kingdom of Sardinia's Savoy territory, before starting to contour to the south. Some half an hour or so after leaving the Pas de la Mort, you meet the Tour de Chartreuse path coming in from the left (1490 m). Turn left. This whole area is a highly protected Nature Reserve, and is very beautiful. Within 10 minutes or so, the path begins to open out to reach a pasture. A source is soon passed, as is the Habert de la Dame (1554 m). A few metres after that there is a junction just before the prairie is re-entered, with the Tour de Chartreuse heading down to the left. If you are short of time it is a useful and pleasant shortcut, rejoining the main route just before the reservoir mentioned below. We, however, keep straight on. For the next half hour the path wanders through the prairie, contouring above the Roche Blanche across which are some fine views. The path then drops into the vallon de Pratcel which follows the line of a prominent geological strike-slip fault crossing the massif. It is a lovely valley - flat-floored with cliffs rising on either side, and covered with forest intermingled with exquisite clearings and meadows. Turn left down the valley, and follow the path down. After 25 minutes, we cross a small stream with a reservoir. There is water available here. Some five minutes or so later, there is a path, the top of which has been renovated (2014), descending the slopes to the left. Descend this - it's a little thin, and slippery when wet, but it drops rapidly over 250 metres through the forest. Near the bottom, a messy forestry track has been superimposed on top of the traditional path, but following your nose will take you directly back to the car park within half an hour of leaving the reservoir above. Given a nice day, it's probably worthwhile sauntering back up the road to the bar, where you can enjoy a well-deserved beer whilst trying to identify the route up to the Pas de la Mort from below.